Photograph, Portrait of Johnny Copeland. Courtesy of johnnycopeland.com. Image available on the Internet and included in accordance with Title 17 U.S.C. Section 107. COPELAND, JOHNNY [CLYDE] (1937–1997). Songwriter and blues guitarist Johnny Copeland was born in Haynesville, Louisiana, on March 27, 1937, the son of sharecroppers. Copeland developed an interest in the blues at an early age. His parents separated when he was six months old, and his mother took him to Magnolia, Arkansas. When his father died a few years later Copeland inherited a guitar and began learning to play it. Houston guitarist and singer Johnny Copeland played blues in Texas and New York from the 1950s until the 1990s. He was nicknamed the "Texas Twister" for his energetic showmanship and style of playing. Photograph by Robert Turner,Larry Willoughby Collection, Courtesy of Huey Meaux. Image available on the Internet and included in accordance with Title 17 U.S.C. Section 107. When Johnny was thirteen years old, the Copelands moved to Houston, where the boy first saw a performance by guitarist T-Bone Walker. In 1954, influenced by Walker, Copeland and his friend Joe "Guitar" Hughes formed a band, the Dukes of Rhythm. While his musical interest grew, Copeland engaged in boxing and acquired the nickname Clyde. The band played regularly in several leading Houston blues clubs, including Shady's Playhouse and the Eldorado Ballroom. While with the Dukes of Rhythm, Copeland also played back-up for such blues figures as Big Mama Thornton, Freddie King, and Sonny Boy Williamson II. In 1958 he recorded his first single with Mercury Records, "Rock 'n' Roll Lily," which became a regional hit. In the 1960s he achieved only limited regional success as he recorded with various small and independent labels. His hits included "Please Let Me Know" and "Down on Bending Knees," recorded with the All Boy and the Golden Eagle labels, both based in Houston. During the early 1970s Copeland toured the "Texas Triangle"—Louisiana, Texas, and Arkansas—and developed a reputation as one of the most frenetic live performers in Texas-style blues. In 1974 he moved to New York City, where he worked at a Brew 'n' Burger during the day and performed in clubs at night. In a few years Copeland became a major draw, attracting receptive audiences at clubs in Harlem and Greenwich Village, and leaving his mark by "brandishing his sizzling guitar, like a slick, sharp weapon." 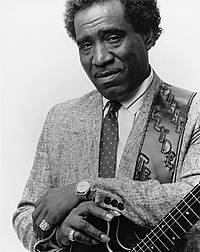 In 1981 he signed with Rounder Records, which released the album Copeland Special, recorded in 1979 with saxophonists Arthur Blythe and Byard Lancaster. This album inspired Copeland to cut a series of albums with the label in the 1980s, including Make My Home Where I Hang My Hat (1982) and Texas Twister (1983), which also featured guitarist Stevie Ray Vaughan. With this recording success, Copeland toured the United States and Europe. In 1986, while on a ten-city tour in West Africa, he recorded Bringing It All Back Home, using local musicians. The album included imaginative hybrids of blues mixed with African idioms. Copeland thus became the first American blues musician to record an album in Africa. Album cover of Johnny [Clyde] Copeland. Image available on the Internet and included in accordance with Title 17 U.S.C. Section 107. That same year he won a Grammy for the best traditional blues recording for Showdown! (1985), an album he recorded with fellow blues musicians Robert Cray and Albert Collins. His follow-up album, Ain't Nothing But a Party [Live], earned him a Grammy nomination in 1988. Throughout the decade he played and recorded with a furious Texas-style blues guitar, performing burning guitar licks that became his trademark and earned him another nickname, the "Fire Maker." Photograph, Picture of Johnny Copeland playng onstage. Courtesy of World News. Image available on the Internet and included in accordance with Title 17 U.S.C. Section 107. Despite adversity, Copeland continued to perform throughout the 1990s. He showed off his songwriting talents when he released his albums Flying High for Verve Records in 1992 and Catch Up With the Blues for Polygram in 1994. The albums included the hits "Life's Rainbow" and "Circumstances." In 1994 he was diagnosed with heart disease, and he spent the next few years checking in and out of hospitals and undergoing a series of open-heart operations. He had been placed on an L-VAD (left ventricular assist device), a battery-powered pump designed for patients suffering from congenital heart defects. He appeared on CNN and ABC-TV's Good Morning America wearing the L-VAD, an event that gave both Copeland and the medical device greater national exposure. He lived a remarkable length of time, twenty months, on the L-VAD. On January 1, 1997, he received a successful heart transplant, and in a few months he resumed touring. During the summer his heart developed a defective valve, and he was admitted to Columbia-Presbyterian Hospital in New York for heart surgery. He died on July 3, 1997, of complications during surgery, and was buried in Paradise South Cemetery in Pearland, Brazoria County, Texas. He was survived by his wife, Sandra, and seven children. Copeland had a lasting impact on Texas-style blues and played a major part in the blues boom of the 1980s. In his career he earned a Grammy, four W.C. Handy awards, and the album of the year award from the French National Academy of Jazz (1995). In 1984 he also became one of the few blues musicians to perform behind the Iron Curtain during the Cold War. Johnny Copeland (http://www.johnnycopeland.com/), accessed October 25, 2015. David Dicaire, Blues Singers: Biographies of 50 Legendary Artists of the Early 20th Century (North Carolina: McFarland, 1999). New York Times, July 4, 1984. Tony Russell, The Blues: From Robert Johnson to Robert Cray (New York: Schirmer, 1997). Michael Erlewine et al., eds., AMG All Music Guide to the Blues: The Experts' Guide to the Best Blues Recordings (San Francisco: Miller Freeman, 1996; 2d ed., San Francisco: Miller Freeman, 1999 ). Vertical Files, Dolph Briscoe Center for American History, University of Texas at Austin. Handbook of Texas Online, Juan Carlos Rodriguez and Matthew Tippens, "COPELAND, JOHNNY [CLYDE]," accessed April 22, 2019, http://www.tshaonline.org/handbook/online/articles/fcocc. Uploaded on June 12, 2010. Modified on December 12, 2016. Published by the Texas State Historical Association.